Dr. Randall West, D.O. and his team of specialists, have recently formulated the all new GHR Platinum formula that helps fight the three common contributors to the aging process: Growth Hormone Decline, Free Radicals Oxidation and Brain Cell Damage. GHR Platinum is advertised on Nationwide radio stations through a show called "Natural Solutions" with Dr Randall West, D.O. and host star, Richard Johnson. Dr. Randall West, D.O., F.A.A.F.P. 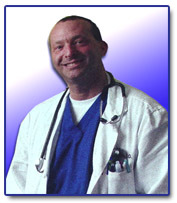 is a Board-certified Osteopathic Physician for over 25 years. Dr. Randall West specializes in the new sciences of preventative and anti-aging medicine. He also cares for the medical, musculo-sketetal and psychological problems in newborns through adults. Dr. West performs Osteopathic manipulation with physical therapy modalities in office as well as minor surgical procedures, EKG, pulmonary function and GYN. Dr. West encourages regular physical exams, as well as lifestyle modifications, such as stress management, exercise and controlling weight, blood pressure and cholesterol. His practice is unique in that he focuses on Preventative and Sports Medicine, with his slogan being: "Catch it before it catches you." Dr. West goes to the source of the symptoms, instead of masking them. He treats the "whole person."